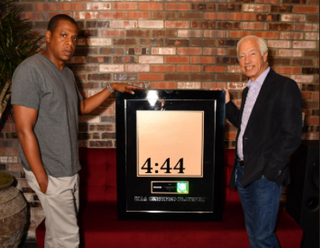 Thanks to Tidal’s partnership with Sprint and fans of Jay-Z’s 4:44, the album has gone platinum in less than a week, according to the RIAA. And for an album that’s not “for sale” as of yet, that’s an incredible feat. 4:44 was released exclusively through Tidal’s partnership with Sprint, and although a free voucher was available for the album, a physical release will be happening soon. In 2013 the RIAA changed the rules for going gold and platinum and made it possible for artists not to have to wait 30 days to get certification for digital sales. This was done right before Jay-Z released Magna Carta. Under the program’s rules, the artist needs to be compensated and there needs to be demonstrated consumer demand in the United States, either for an on-demand stream or a sale. A sale counts toward a certification if purchased directly by the customer or a business can purchase the album or song and offer it to fans who must take affirmative steps to acquire the album or song.